J. Taylor Publishing Christmas Cracker** Scavenger Hunt! This week TEN J. Taylor Publishing authors are taking part in a scavenger hunt, which means there will be multiple chances to enter for a shot at an AWESOME GRAND PRIZE! PLUS, there are more goodies up for grabs at EVERY stop along the way! All you have to do is leave a comment telling me what books you plan to read over the holidays—name or count or both—because I’m a Nosey Nelly and I like to know what Christmas reads people are scoping out, and you will be entered to win an EBOOK OF Make Believe. Make sure you leave me a way to contact you in case you’re my winner…either in the comment form or the body of your comment. Thanks! 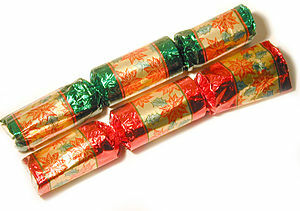 Christmas crackers, bon-bons, are part of Christmas celebrations primarily in the United Kingdom, Ireland and Commonwealth countries such as Australia, Canada, New Zealand and South Africa. A cracker consists of a cardboard tube wrapped in a brightly decorated twist of paper, making it resemble an oversized sweet-wrapper. The cracker is pulled by two people, often with arms crossed, and, much in the manner of a wishbone, the cracker splits unevenly. The split is accompanied by a mild bang or snapping sound produced by the effect of friction on a shock-sensitive, chemically-impregnated card strip (similar to that used in a cap gun). One chemical used for the friction strip is silver fulminate, which is highly unstable.Assembled crackers are typically sold in boxes of three to twelve. A $100 Amazon Giftcard just in time for Christmas! Question: What song was playing in Gayle’s office after a fateful work party a few days earlier? Enter for the GRAND PRIZE by answering my question using the Rafflecopter form at the bottom of this post. And don’t forget to enter the NEXT STOP (Emi Gayle’s blog) on the Hunt for another chance to enter and another prize opportunity! Don’t worry if you get lost. Simply hop back to the J. Taylor Blog, where you can find the complete list of authors and links. So, in summary, comment here for a chance to win Make Believe; answer my scavenger hunt question in the Rafflecopter for a chance at the grand prize. P.S. If you want a chance to win my book, The P.U.R.E., be sure to hop over to Terri Rochenski’s blog or J Taylor’s blog. I’ll kick off the comments. Over the holidays, I plan to read the last in the Divergent trilogy, my monthly Amazon Kindle Lending Library freebee (Mr. 365) and Eleanor and Park. I downloaded some of the free Christmas stories from Amazon recently and was really looking forward to reading them over the holidays, but my Kindle has been giving me trouble lately. I think I need to wipe out the whole thing and start over. I’ll admit, I’m nervous about doing that though. So, I may start on the Immortals After Dark series by Kresley Cole as I have those in paperback form. Thank you for the fun giveaway opportunities! Merry Christmas! I plan of reading the 12 NA’s of Christmas books on my Kindle.